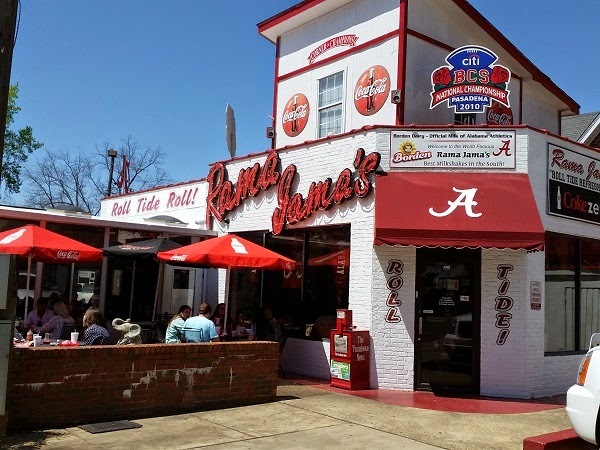 Rama Jama’s, Tuscaloosa AL – Marie, Let's Eat! We’re keeping things very low-key and stress-free with our daughter, who is wrapping up her sophomore year of high school, but I decided that we should incorporate some walks around colleges with our road trips, so that she can look around and get a feel for a place outside of the formality, and pressure, of actual campus visits. So since I wanted to go back to Tuscaloosa, we planned to spend a couple of hours on the incredibly attractive campus of The University of Alabama. Now, I must say that Bryant-Denny Stadium is not one of my favorite designs (although I love, in a very real sense, how the visitors’ center is literally underneath the stadium, just to put things in perspective), but wow, I really was impressed by all the nice buildings and gorgeous landscaping and terrific people. It’s a really nice campus. I didn’t even mind much that the special collection that I wanted to visit was closed on Saturdays, because the library itself is quite wonderful. My daughter didn’t get the vibe that she was hoping for here, which should please a couple of our readers that bleed Volunteer orange and Tiger blue, and so she was a little discouraged. We tried to assure her that it was more important to visit a campus and find the right atmosphere, and these things might take time and travel. But, as we’ve noted before, she is cursed with some serious Mercurial Teenage Weirdness, and even after exploring on her own for most of an hour, away from us uncool squares, her unhappiness grew. 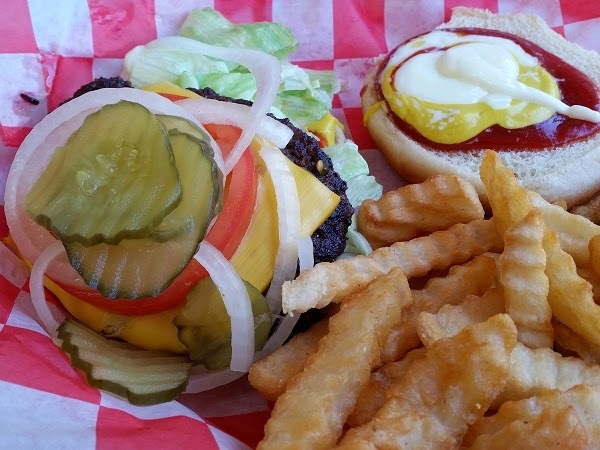 Plus, she’d skipped lunch at Archibald’s in favor of our next stop, and was probably more than a little “hangry,” so we made our way to Rama Jama’s for a burger under her dark cloud. I think that Rama Jama’s is the first privately-owned restaurant I’ve seen that’s literally across the street from a college football stadium. No kidding, if you’ve got seats in the upper deck, you could litter on Rama Jama’s roof. Please don’t do that. Rama Jama’s is a little more than that archetype of a place where all the students eat, and then revisit after they’ve graduated, like you find in lots of college towns. ESPN’s Todd Blackledge wrote a book a few years ago called Taste of the Town, based on his short segments for TV, which is a bit like Diners, Drive-Ins, and Dives at a lower volume, and it’s brought tourists in by the busload as well. Unfortunately, Rama Jama’s is all about the experience, and the sensory overload, and not necessarily the food. The interior of this place is a museum. I mean that. Sure, lots of college eateries have newspaper stories of their teams’ triumphs, but this place not only takes it to extremes with every available inch of wall space covered with crimson and white and letters from coaches, but also with donated uniforms, pads, helmets, all sorts of stuff. So if you want to see the very shoes that some player wore when he kicked that overtime field goal that beat so-and-so, they’re in a case on the wall. The burgers were really not too far along the spectrum of “okay fast food burgers.” The most remarkable thing about them was the buckets of toppings. I normally just have lettuce, tomato, and mayo on burgers, but for some reason I said “everything” and they took that literally or something, giving me what seemed like the entire bottle of ketchup, and all the mustard, and exactly one napkin. The fries were from a truck, and we had to wait a while on drinks because they were fiddling with the lines and the Coke was coming out flat. Well, nobody comes here for a great meal. They come for the Bama tradition, and to start new memories, and to revisit them when they come back for a game or a reunion, and I don’t begrudge that one bit. Even though my daughter will probably not end up shouting “Roll Tide,” she brightened a little after her lunch, and was much more pleasant company for the next couple of hours. Posted on May 13, 2015 August 21, 2017 by Grant G.Posted in alabama, burgers, tuscaloosaTagged alabama, burgers, tuscaloosa.